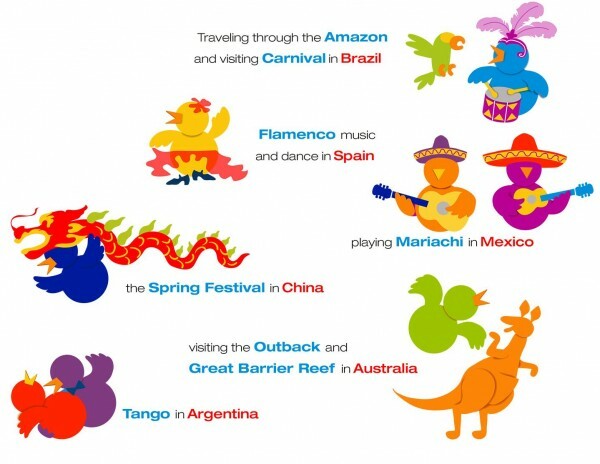 This Winter & Spring, our curriculum is taking students on an imaginary journey around the world through music! Each week, we're "traveling" with Henry in his hot air balloon to a new country to meet its music and culture. Join us to get immersed in the diverse sounds and languages of the world while meeting the instruments of the orchestra & targeting development goals through play! In addition to the music we'll meet from each country, our musical selections will also include a wide variety of genres to keep everybody- kids and adults- excited about class: classical, rock, kids favorites, popular hits & more!